This gratin/pot pie is a "kitchen sink" creation of the vegetables, pastry dough and cheese that I had left over from a fiasco of sorts. I had planned to make some sort of lattice pot pie for Jane Smiley's "Private Life" to represent the main character's feeling of being trapped in a loveless, unhappy marriage. This veggie pot pie came about because I had purchased a whole bunch of vegetables and other ingredients and made a batch of savory pie dough in preparation for going to a "Master Chef" open call here in Boston. For the open call you were required to bring a dish for the judges to taste, and you may be sitting there all day, so it should be something that tasted good cold. For those of you that don't know, Master Chef is a pretty cheesy show on Fox where celebrity chef Gordon Ramsey screams profanities at a bunch of amateur cooks who want to become a "Master Chef" (prizes are that title, some cash and a cookbook deal). So, anyway, I thought it may be fun to go to the open call even though I didn't really fit the mold - I am not super hot, a fireman who cooks for my crew, or someone with a really poignant sob story. Despite that, I took a day off from work the day before the Open Call and planned to spend the day in the kitchen experimenting and coming up with a really good savory/tart quiche and fall salad combo. Unfortunately, I was unable to cook that day because of a plumbing malfunction in my apartment. So, I have all these great ingredients so decided to throw them together and make this rich vegetable gratin with a lattice crust. It is sort of random, but definitely works and would be a great vegetarian main course for Turkey day. More about the book after the jump. I have read most of Jane Smiley's books since her breakout award winning "A Thousand Acres" but have not found any of them anywhere near as enjoyable (to me) as that book. Her latest book, "Private Life" has some jacket quotes that declare that it is as good if not better than A Thousand Acres. Unfortunately, I found this to be an incorrect statement. This book was sluggish and a bit frustrating to me. The book follows the life of Margaret Mayfield, a St. Louis woman who, on the verge of becoming an old maid, marries a quirky, difficult scientist named Andrew Early at the turn of the century. Captain Early whisks Margaret off to San Francisco, where he works on a navy base, and the book follows Margaret's life and her marriage through the decades, up until World War II. The problem is, in all those years, nothing really happens because Margaret doesn't DO anything. She is enormously passive, and though she is unhappy in her marriage almost from the start, she does nothing to get out of it or make herself happy. Even worse, though she finds her husband a bit of a fool/crackpot, she does nothing to criticize him or correct his behavior until it is too late. I thought the summary on the bookjacket did a disservice here - I believe that it stated that there was some shocking secret from Andrew's past that would rock Margaret's world or something like that. I kept waiting for that big secret to come out, and it never did. I think what they meant was that he had a history as a plagiarist, sorry to give away the big secret here, but plagiarism does not make good drama, you know what I mean? Smiley also throws in some other characters in Margaret's life and it is these characters that reflect the changes of the time (e.g. World Wars, depression) rather than Margaret, who until the end remains unchanged. These characters are somewhat interesting - a Japanese midwife and her family, Dora's childhood friend who stayed single and became a reporter, and Pete, a drifter/Cossack who captures Margaret's heart (but I never really understood why). All that said, this is certainly a fully realized portrait of a very bad marriage, and an exposition of how we all contribute to our own bad situations. The book moves slowly and covers a lot of time - I think if I was able to get behind Margaret I might have enjoyed the book more. 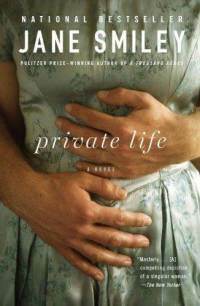 Private Life has been well reviewed by the professionals, so I would not let my thoughts sway you if the book interests you. So, this really was just thrown together, I don't have a great recipe for it, but will do my best. I had prepared roasted squash, mushrooms with shallots ready to go. For the squash, I cubed 1 butternut squash, tossed it in 1 tablespoon of balsamic vinegar and 2 tablespoons of brown sugar and roasted until tender. For the mushrooms, I just sauteed some baby Bella and oyster mushrooms with 2 chopped shallots and olive oil. I decided to add some spinach and kale (which I simply blanched in boiling water - kale in first for 2-4 minutes, spinach in next for 30 seconds or less. I drained these very well. I also added some boiled disks of Jerusalem artichokes (or sunchokes). Some small new potatoes or celery root would be great too. Then I sauteed some sliced fennel with some garlic and chopped herbs (I used thyme and sage). Onions would work great in place of the fennel. Finally, I made a cheese sauce to pour over it and then topped with a lattice basic pie dough. This kind of dish will work with any vegetable combination you want and would be a perfect use of leftover veggies. Directions: Pulse flour and salt in a food processor till combined. Add butter, toss to coat the pieces with the butter, then pulse 4 - 10 times until the butter is in small pebble like pieces (there still should be some pieces of butter, it shouldn't be like sand). Add the egg yolk and 2 tablespoons of ice water. Pulse 1-3 times, look at dough, if it is not coming together in places and looks dry, add more water a tablespoon at a time. Pulse 1-2 more times. The dough should stick together when you squeeze it, but should not be one mass. Turn out the dough onto a floured work surface and form into a ball, divide the ball in two, form discs and wrap in plastic. Chill the dough for at least 1 hour, can stay in fridge for a few days before you use it. For the lattice, I simply rolled out half the dough and cut strips. Directions: In a medium sized saucepan on medium low heat melt the butter, stir in the flour and cook, stirring with a wooden spoon for a few minutes - about 5, you want to cook some of the flour taste out (the darker you let the flour get the darker your sauce). Add the milk slowly and stir constantly to incorporate, cook on medium heat, stirring, until the sauce thickens. Taste it to see if it still has a floury taste - you want to cook it until this taste is out, but no more than 10 minutes. It should be thick. Take off heat and stir in cheeses, use immediately. Assembly: Preheat oven to 375. I sprayed with cooking spray 4 Little casseroles - one medium casserole would work if you want to make one. I added the leak and garlic mixture first, then the mushrooms, then the greens/sunchokes, then I poured about 3 tablespoons of cheese sauce over the greens, then added the squash and then the crust. I put the casseroles on a cookie sheet, baked until the crust was golden brown, about 20 minutes. Pictures of the assembly below. Note: I overcooked my cheese sauce a bit, it is thicker than I would have liked.